Combine the sugar,water and ginger in a small saucepan. Warm over medium heat, stirring until the sugar dissolves, then remove from heat and allow to cool to room temperature. To make the cups from the peels, cut the top inch or so off of the top of 12 of the satsumas. Use a spoon to gently scoop out the flesh while taking care not to rip the peel. Place the peel cups on a baking tray and freeze until solid. Squeeze the juice from the flesh you removed as well as the tops. 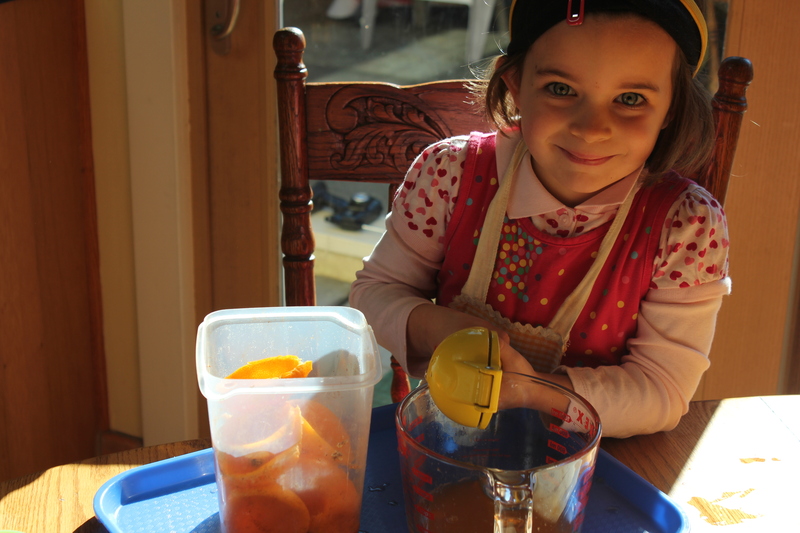 Halve the other satsumas and juice until you have 2 cups of juice. Combine the cooled sugar syrup (discard the ginger) with 2 cups satsuma juice and the lemon juice. Stir to combine. Pour the mixture into a non-reactive 8 inch square baking dish. Freeze until solid. Once solid, scrape a fork across the surface to fluff up granita. Scoop the fluffy ice into the frozen peel cups. Serve immediately or keep frozen for up to one day. I love your kitchen pal! Definitely delicious fun! 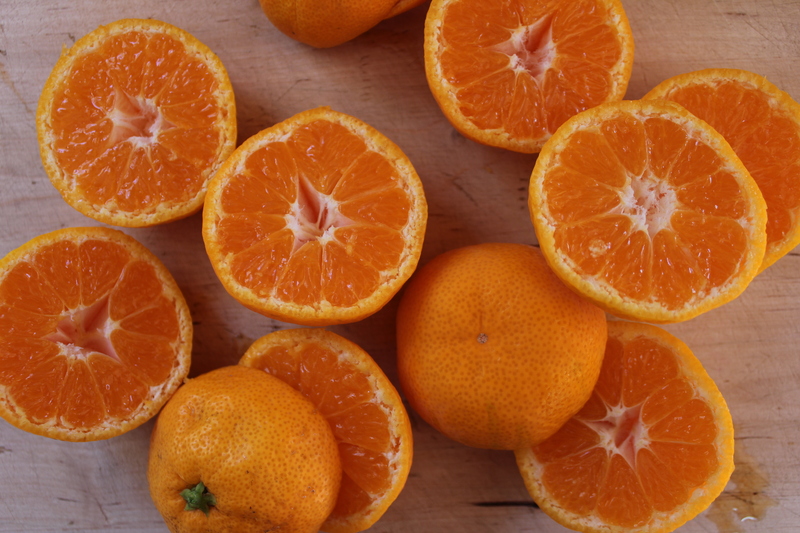 I’m envious of your fresh picked citrus…I’ll have to content myself with the market. 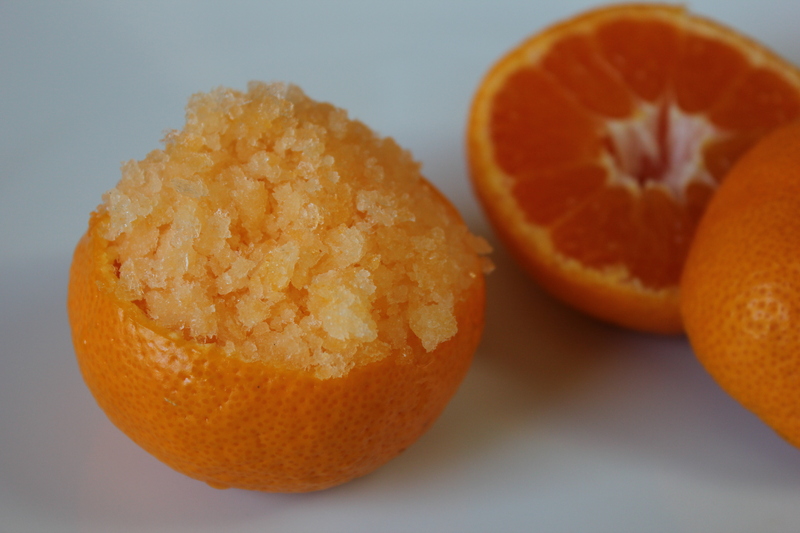 Such a fabulous way to enjoy satsumas! We usually devour them quickly, so I’ll have to pick up an extra box to try this granita. What a sweet sous chef you have!